The Chesapeake shop is closed July 25-29 for inventory and will reopen August 1. The Newport News shop will be closed for inventory August 1-5. Start shopping early for Back to Troop savings and receive a free book bag when you purchase a complete Starter Kit. Receive a 15 percent discount off the entire purchase. Cannot be combined with any other offer. Volunteer Kickoff - Register Now! In celebration of the 20th anniversary of A Place for Girls opening its doors in 1996, Girl Scouts of the Colonial Coast launched a Buy a Brick campaign. Thanks to nearly 60 thoughtful donors who purchased bricks, many volunteers, girl members and alumnae will be recognized or remembered with a “brick of honor.” Donors and many of those being honored through this effort will be joining us on Thursday, August 18 at 4:45 p.m. for the inaugural brick dedication ceremony. The ceremony will be followed by a reception and social with the Council’s board of directors. We are honored to welcome Janine Latus, author of the international bestseller, If I am Missing or Dead: A Sister’s Story of Love, Murder and Liberation as our guest speaker. Sign up to share the opportunity for more girls to join Girl Scouting – and earn community service hours at the same time! Volunteers are needed to staff a Girl Scout table where they will talk to parents and girls about Girl Scouts. Volunteers will help parents fill out an interest form in person or online. These opportunities are open for adults as well as girls (Girl Scout Cadettes, Seniors and Ambassadors). Girls will earn volunteer hours towards their Community Service to Girl Scouts bar. See the deadlines below to register to volunteer for each event. Contact Kim Lincoln at kiml@gsccc.org to register. 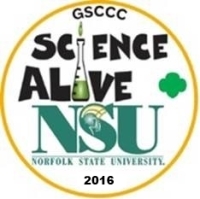 Enjoy hands-on activities led by faculty and students in the fields of STEM at the 6th annual Science Alive event. Learn about engineering, chemistry, medicine, biology and physical science! Spend time on campus, meet sorority sisters and take part in the traditional lunch time dance party. Helping girls earn and manage money is an integral part of the Girl Scout Leadership Experience (GSLE). Learn how to work with girls to cooperatively set goals, make decisions, manage a budget, maintain records, learn people skills, and develop good marketing, entrepreneurial, math and financial skills. During this module you will also learn about the paperwork you need to complete reporting guidelines and policies. Chef Dedra Blount has a few openings in her Culinary Cooking summer programs. Different classes are offered each week. Visit www.nowurcooking.com for dates, times and ages. Classes are held at the Now You’re Cooking location at 1128 N. Battlefield Blvd. #105 in Chesapeake. Call 757-401-4400 or email nowurcookingonline@gmail.com for more information. This course will teach you how to integrate the badges and Journeys together. Questions? Contact Cheryl McGrenra, Adult Learning Manager at cherylm@gsccc.org. All GSCCC offices and shops will be closed Monday, July 4 in observance of Independence Day. Take an additional 20 percent off clearance merchandise. Cannot be combined with any other offer.